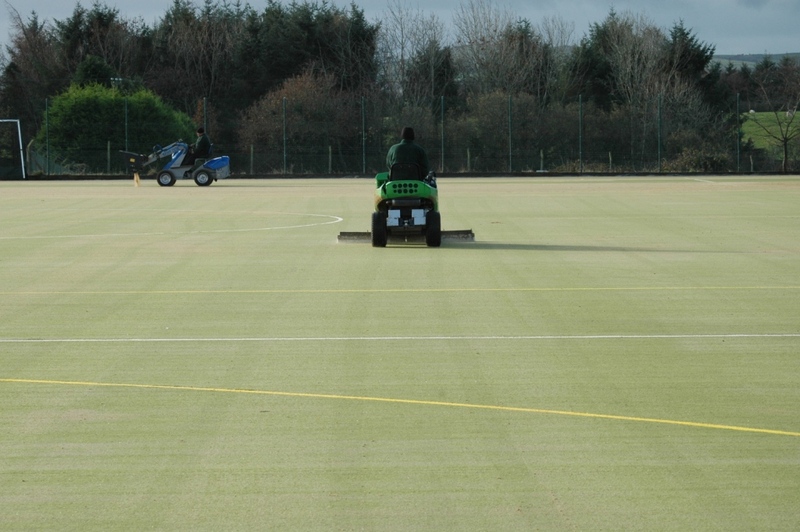 We have carried out hockey pitch services for a number of organisations across the UK, including schools, sports clubs and leisure centres. One of our core activities is the construction and installation of surfacing for a number of different specifications and designs. Each service can be fully customised to suit the client and fit in with any budget requirements. We are always on hand to answer any questions you might have about these types of sports flooring. Don’t hesitate to get in touch with us via the contact form on this page if you would like some more information or advice on costs. Just tell us what kind of services you need, an area size for the project, and your location so we can offer a quote for the work. 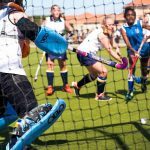 What is a Synthetic Hockey Pitch? 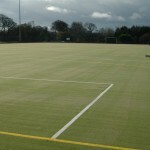 A synthetic hockey pitch is a sports facility made from artificial surfacing rather than natural grass. These tend to be more durable and long lasting, as well as being porous to prevent flooding. A number of schools and clubs in the UK now have these surfaces as their are much easier to maintain, and they still offer great performance qualities for hockey. 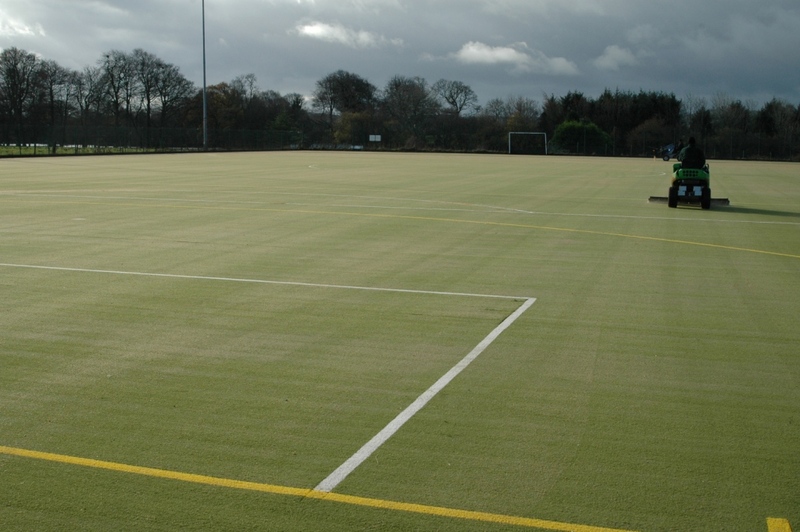 One of the most suitable hockey pitch surfaces that we install is sand dressed artificial turf. This has a thin layer of sand installed within the grass fibres to keep the surface stable and allow the ball to glide evenly. 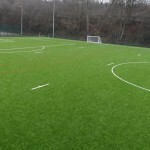 If you are looking to install a facility which can be used for multiple sports such as football and tennis as well as hockey, a sand filled grass surface would be more appropriate. 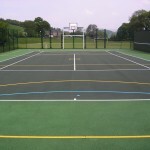 This is a hard wearing and durable surfacing option which provides good performance and safety qualities for a variety of sports. For anyone who is looking to install a brand new sports field, this is another service that we offer. When it comes to hockey pitch construction there are plenty of options to choose from and you can have a bespoke facility made. The dimensions can be adjusted to fit your outdoor space, and to accommodate your budget when you need to cut costs. 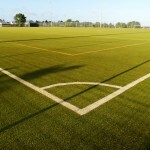 We also offer a number of surfacing types depending on what level of playing qualities are required. The costs and prices for the different services we carry out can differ between every individual job. Quotes are devised based on a number of variables including the scope of the work, the site location and the existing condition on the surface. We aim to offer prices which fit within the budget of each organisation while still providing a great quality product to meet your requirements, so compromises can be made based on factors such as surface specification and extra equipment. The application of sports line markings and the installation of additional fencing and floodlighting can all be included as part of our hockey pitch services to ensure you have a top quality product. Just be sure to ask if you are interested in any of our other products and we’ll send you over some information. Another of our hockey pitch services which is regularly offered is cleaning and maintenance of the surface once it has been installed. It is important to keep the sand infill levels topped up and to make sure that the sand is clean and free from dirt and debris. If the sand infill is not properly maintained it can become contaminated and cause the turf to hold water which leads to flooding and damage to the surface. Regular cleaning of the surfacing is vital as it prevents the need for repairs or a possible resurface in the future. If your synthetic pitch does become damaged, we can carry out repairs to seams, edges and rips in the carpet to bring it back to its original performance quality. For any sports surface it is vital to make sure it is kept clean so that it’s safe and enjoyable for people to use. 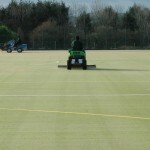 Various methods of hockey pitch maintenance are offered by our team to keep these facilities performing at their best. These services include cleaning, brushing, synthetic turf repairs and infill rejuvenation, all of which help to prevent damage and ensure the best quality sports flooring. In this video you can see our team completing rejuvenation work for an existing sports facility. This type of work is often incorporated into hockey pitch repairs which are done if the surfacing becomes damaged. In this project, the artificial grass had become contaminated with moss and debris which meant it was holding water and couldn’t be used safely. The process of rejuvenation was done to remove the dirty sand infill and install a completely new clean layer. This greatly improved the playing qualities for the pitch and brought back the original porous qualities for efficient drainage. We’re able to complete this work for various facilities at schools, colleges and leisure centres to improve the playing qualities of pitches. If your sports surface is waterlogged and contaminated, don’t hesitate to contact us for more advice. 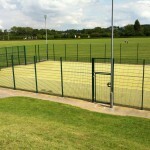 We have worked on many projects involving hockey facilities throughout the UK. These have included complete construction works as well as simple repairs and thorough rejuvenations of the artificial carpet. 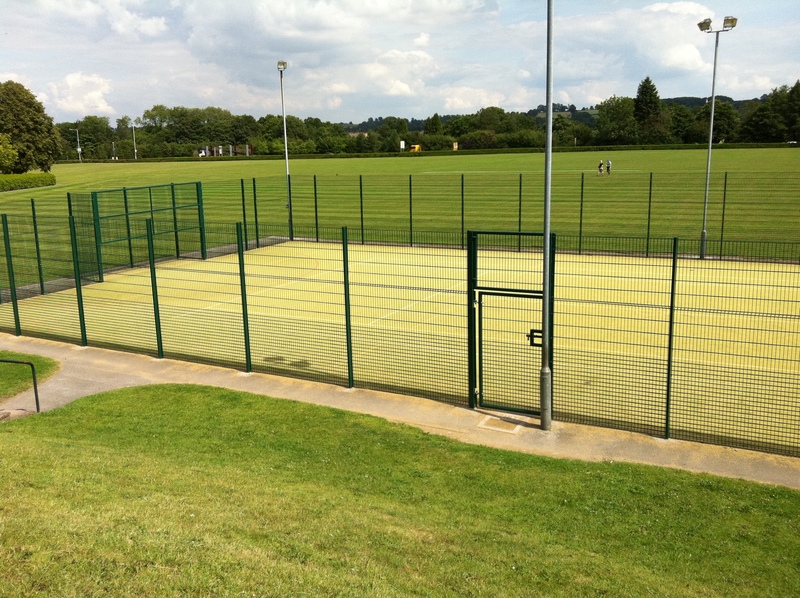 Our clients often choose to add extra products like hockey pitch fencing to make the sports field more secure and suitable for evening use. Outdoor floodlights are also popular for facilities which might be used in the evening, and this is another thing we supply. Cleaning and maintenance costs can also be managed as part of our aftercare service, it’s important to have your artificial hockey surface well maintained to make sure that the performance and safety characteristics meet the FIH guidelines. 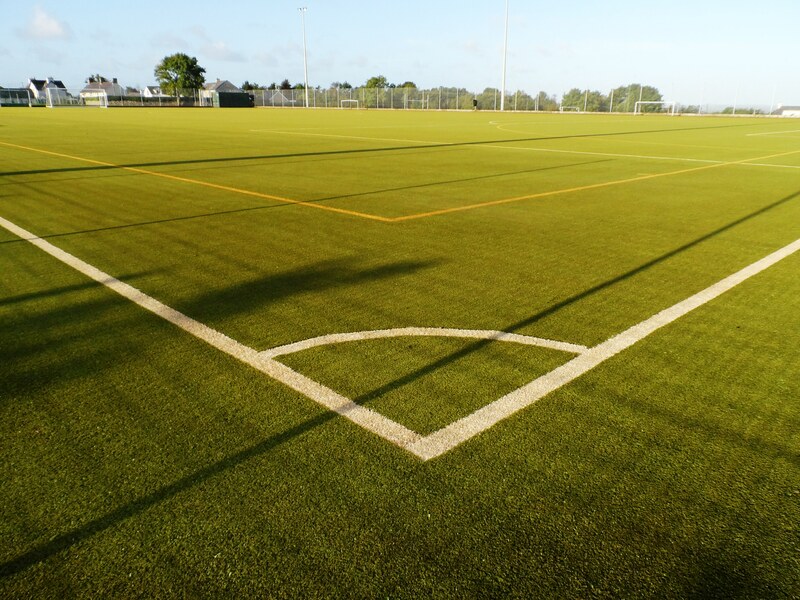 If your facility is not looked after properly, this can lead to surface damage and flooding which is costly to repair and may even cause the pitch to need resurfacing. A top quality hockey facility will be an investment for your organisation as renting it out to other teams and clubs can help to increase revenue. We pride ourselves on offering great value products and an excellent end result which you can enjoy for a long time. Through working in various schools, colleges, universities and sports clubs we have developed a wealth of experience. Our specialists can talk you through all of our services and advise you on costs for anything that you need. Just contact us to speak about everything we can do in more detail. Our enquiry form enables you to get in touch with us if you require any of the hockey pitch services mentioned on this page. So be sure to fill in your details and we’ll get back to you with some more information. One of our experts will gladly offer you a quote for any construction or maintenance work you need carried out. 1 What is a Synthetic Hockey Pitch?